Some steps may require wire cutters; see notes below. In addition to the electronics, the kit contains five laser-cut pieces and four #4-40 x 1" screws and nuts. Peel the paper backing from both sides of the acrylic stand pieces. Some people use a razor blade as a scraper to get this started, but a fingernail at a corner is usually sufficient and won’t gouge the plastic. For reference, here’s what a completed LCD+Backpack will look like, both front and back. 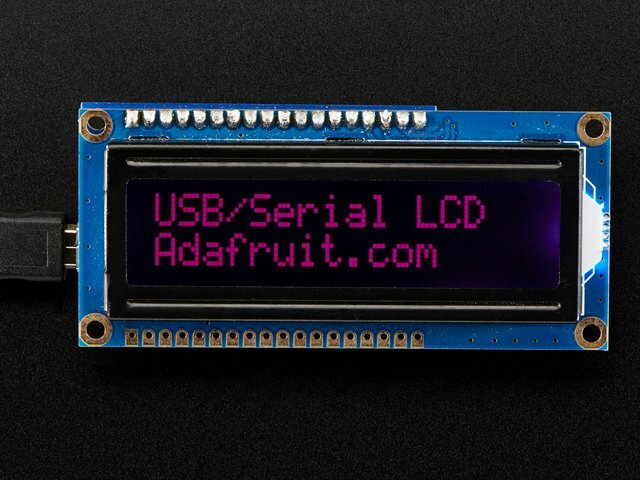 Looking at the face of the LCD, with the backlight LED protruding from the right, we’ll be soldering to the header row across the top. 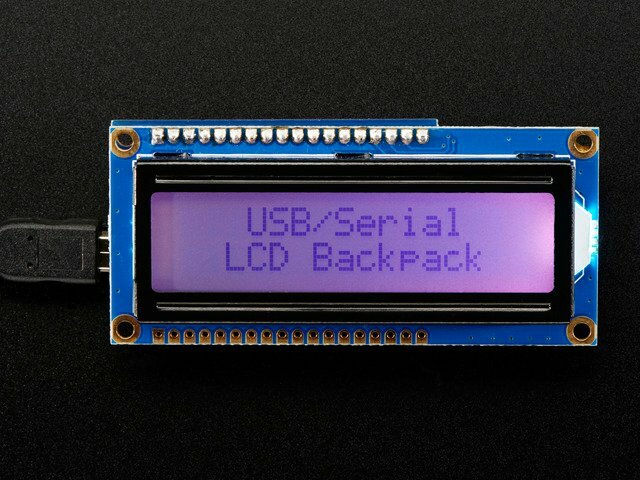 From the back, the USB and serial connectors should be along the outside edge, and the text on the backpack board is upside-down with respect to the LCD. Usually the included pin strip is the same length as this header, but in some cases you may need to trim a few off. Use pliers or wire snips for this; doing it by hand sometimes snaps at the wrong spot. The pin strip has a long side and a short side. The long side of the pins should point back, to the header on the backpack board. To help with alignment, temporarily insert one of the screws through the corner mounting hole on both boards. Solder just the first and last pins on both front and back. Make sure both boards are aligned and parallel, and that the screw is pointed straight back. You can re-heat those four solder joints as needed while getting this alignment right. Once everything is square and level, solder the rest of the header pins on both sides. If you accidentally installed the pin header the wrong way (long side facing forward), no biggie…you’ll just need to clip off the pins before fitting in the stand. Insert 2 screws through one end of the front bezel, then slide one of the small spacer pieces (they resemble tiny handlebar mustaches) over the screws, and finally the LCD. 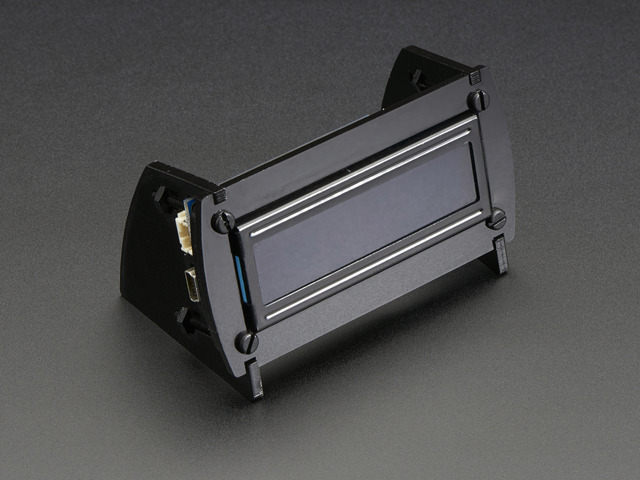 Let’s start with the end where the LCD backlight protrudes, it’s a little easier. The spacer for this end has an extra bite to fit around the backlight. Add nuts to these two screws. Position them about 1/10" (2mm) down the screw. Install the first side; the longer straight edge is the bottom. Align the front notches with the piece held at an angle, then pivot up so the screws/nuts fit into the cutouts . You may need to tweak the nut positions a little and try again. Give the screws a couple turns…just “finger tight” for now. The spacer/screw arrangement is similar for the second side. With the first side already installed, we won’t be lowering the board and spacer into place…instead the pieces are aligned and the screws inserted front to back. Install nuts as before, and the second side then similarly pivots into place. This one’s a little fussier due to the port cutouts. When tightening the screws, give a gentle squeeze so there’s good contact between the side and front pieces; we don’t want the side piece to splay outward. If everything looks good and straight, you can give all the screws an extra half turn or so to hold more firmly…but not so tight as to crack the plastic! Taa-daah! Ready to plug in. This guide was first published on May 10, 2013. It was last updated on May 10, 2013. This page (Assembly) was last updated on Apr 22, 2019.